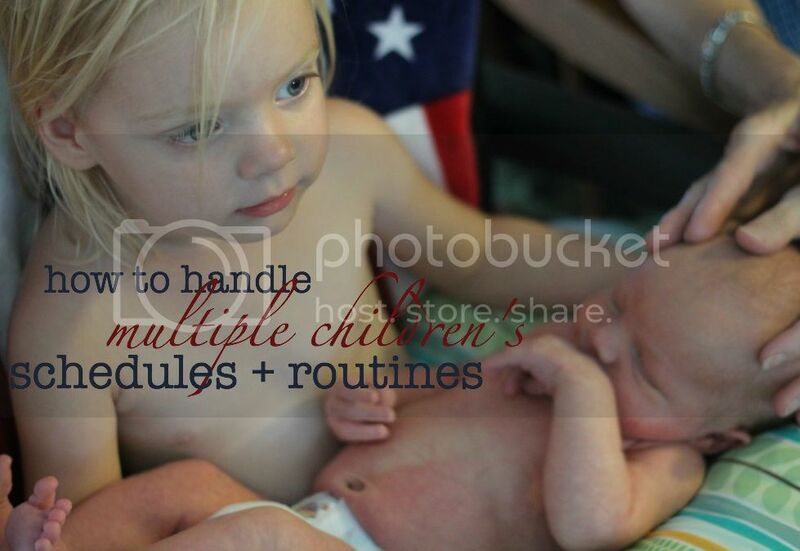 Big tips on handling kids close in age throughout your day. As mothers we learn lots of tricks to keep the house from burning down while we’re on duty. With each child we’ve welcomed into the family we learn something new. In fact, each child brings with it new opportunities to see just how good of a juggler you are. If you are like me (and for better or worse I think many of you are) then you pretty much need your routine and schedule to keep a positive atmosphere in the house. One or two days of chaos and I’m contemplating sending in my resignation. My Prince is about 9 weeks old now and in that short amount of time I’ve really began honing my juggling skills. Here are some tips on how to manage schedules and routines for lots of children (lots being relative, of course). (1) Learn how to corral. There are times when I need to do something and it will not go well if there are small feet running around throwing phones in the toilet and trying to catapult rock the baby in his infant seat. During these times I often employ the temporary incarceration method. I’ll put my son in his crib and my daughter in her room while I take care of something quickly. If I need to bathe one I will put the other at the table with crayons. It’s not rocket science, but I will both physically and mentally occupy the children so that I’m able to do what I need to do. I don’t ask what they want. I don’t test them by taking forever. I just put them where I know they’ll be out of the way safe and I go about my business. (2) Think about it in advance. 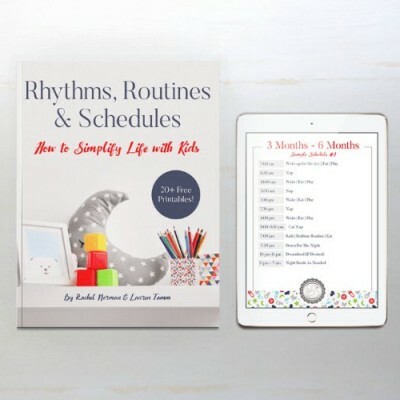 Before my third was born I thought about what type of schedule would work best and I did my best to put it into practice. Luckily, the schedule I planned before his birth has worked perfectly. I wanted to be able to have a few feeds during the day where the older siblings were occupied. I wanted peaceful quiet cuddle time during nursing and after. The older kids are in independent play for one feeding and are down for a nap for two others. Based on the kids’ needs I determined where naps and meals fit best, and so far so good. (3) Help them to know what comes next. The Birth Order book suggests that firstborns are resistant to change and, therefore, function better when they are prepared for what’s next. Regularly I can be heard saying “in a few minutes we’re going inside” or “after we finish this game we’re going to have lunch” etc. I think routines, in general, help children to behave better because they know what to expect. Nap time isn’t a disappointing shock. Having to come inside for lunch isn’t a form of punishment. When children know what to expect, because of routine and how you inform them, they are much more likely to rise to your expectations. (4) Make it work for you. I need times during the day to be alone. I’m an introvert and if I don’t have a moment or two alone then by the end of the day I am in such a bad mood only Diet Coke and pepperoni pizza can get me out of it. And even then it’s iffy. I’ve worked our routines so the children play independently in the mornings and nap at the same time in the afternoon. Times vary, but generally speaking, I get some time of refreshing during the day. This is particularly helpful as I work from home. If I didn’t know there were already pre-determined times for me to complete my work then it would simply be too stressful a situation to continue. (5) Know the right times of day. Self-control and willpower are finite. As the day progresses we have less and less of them. Our children are exactly the same. What a child could stand in the morning may cause a meltdown by dinnertime. As bedtime approaches kids somehow, miraculously, sprout wings and begin to fly all over the house in some sort of pre-bedtime frenzy. That isn’t the best time to expect them to sit still on the floor and do flashcards. We don’t generally plan major outings during the afternoon nap because they’d be fussy and irritable and it wouldn’t be fun. If we want to be out and about and playing then we schedule it in the mornings. Each house runs differently and the key is finding a good rhythm for your children. And I mean that collectively. At some point each family member will have to sacrifice preferences for general harmony. How can all the children’s needs be met and how can you do it in a way that keeps the house standing. They may not like doing the dishes. Guess what? I don’t either. Maybe they don’t want to pick up their toys. Wanna know something? I don’t want to pick up their toys either. Especially since I didn’t distribute them equally throughout every room in the house. We find a balance between having them do things they love and having the do things they need to do. Just taking a little time out from keeping things afloat, to planning how you can run a smoother household will make all the difference. It does? Ha, thank goodness! Seriously. It does. :o) Mine are 3.5, 2, and 10 months now. And while it’s still not “easy,” it’s not as overwhelming as it once was. I’m going to write that on a notecard and put it under my pillow… ha! Oh you will LOVE two when you have them. How did your trip go? OMG you work from home too?!?!?!?! I ALREADY thought you were straight up super mom with having a brand new baby and making the transition to three seem so flawless, and now I find out you work from home too?!?! You are my new idol. Legit!!!!!!! Actually right now I’m on maternity leave so I’m not working. And I’m having nightmares of having to start back so… if I seem like I’m keeping my cool then I repent for my deception. Hahah! I think you are saying what every mother goes through. Some phases are all about the baby, some are about toddlers and losing it is sometimes what happens. I occasionally lose it and then sit them down and honestly explain, apologize and move on. I think if it happened all the time it is a greater issue, but occasionally I think it is just a chance to explain emotions and reactions triggers and ttempers! This is super helpful, thanks! 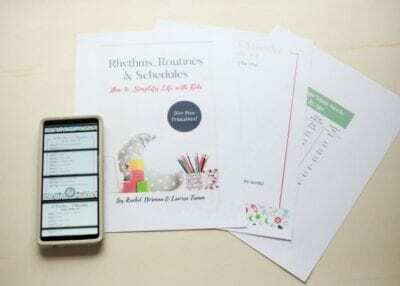 I’m not a type A personality and once I had kids I was disappointed to find out that things run best with a solid routine, especially for my oldest who craves routine and isn’t very flexible. I have 3 under 3 (totally planned, no twins) and am in the middle of this, trying to figure out how to meet everyones many various needs. Its really challenging with an infant who really prefers to be held all the livelong day and two active, attention caring toddlers. This post was written a wihile ago, any updates now that your kids are older and i think you also have a new baby?